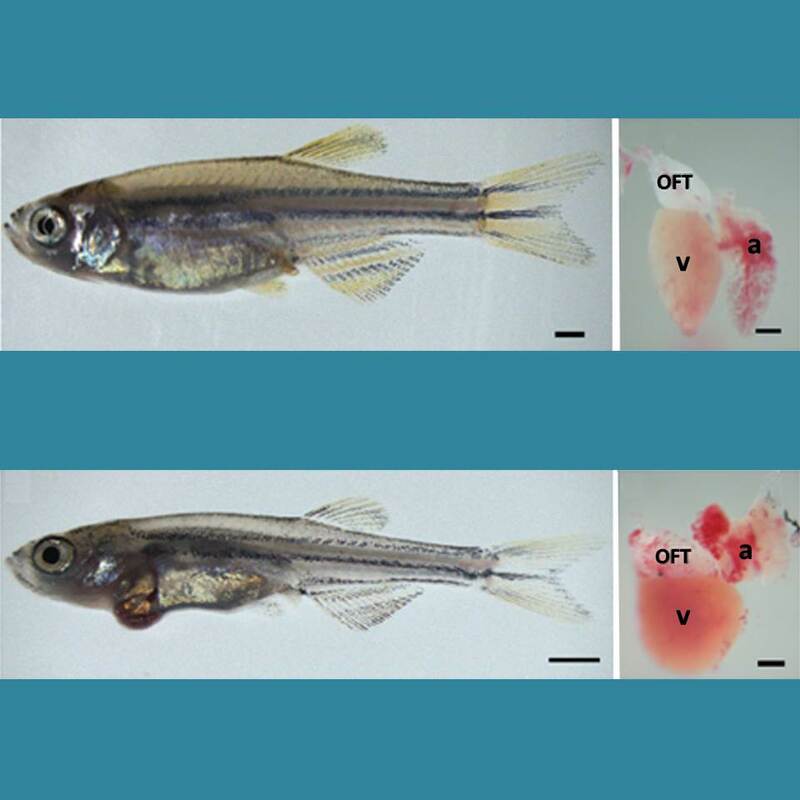 Caption: Healthy zebrafish (top) compared to zebrafish with arrhythmia-causing mutation (bottom). Their hearts are shown to the right, with enlargement indicating a weaker heart. The heart&rsquo;s outflow tract is marked OFT; atrium, a; and ventricle, v.
Arrhythmia is a condition in which the heart loses its regular rhythm, beating either too rapidly or too slowly. Occasional irregular heartbeats are harmless, but if sustained they can cause dizziness, fainting, and even sudden death. There are a number of drugs available that can prevent arrhythmias, but none are perfect. Implanted devices can help—pacemakers can keep the heart from beating too slowly, and defibrillators can reset the heart&rsquo;s rhythm with an electrical shock if a dangerously rapid rhythm develops. But new treatments are needed. Now, an NIH-funded research team has created an animal model that is advancing efforts to find new drugs to prevent arrhythmia.&nbsp; Led by Jeffrey Saffitz at Beth Israel Deaconess Medical Center, Boston, researchers used genetic engineering techniques to produce zebrafish with genetic mutations identical to those in some people who suffer from a rare inherited disease called arrhythmogenic cardiomyopathy (ACM). In humans, ACM leads to dangerous arrhythmias that can cause sudden cardiac death, usually in people under the age of 35. The genetic mutations responsible for ACM disrupt proteins that make up the desmosome, which is a cellular junction structure that glues heart cells together and is vital for proper electrical signaling and regular heartbeats. Microscopic exams of ACM patients&rsquo; hearts show that many muscle cells have been replaced with fat and scar tissue.